If you are a snapper fisherman and you have never tied on a Black Magic Snapper Snatcher you are seriously missing out on an amazing snapper rig. I have been using Black Magic Snapper Snatchers for the past six years in my spread and from the first time I started using them I have found instant success. A Snapper Snatcher is a pre mad rig made by New Zealand tackle company Black Magic. It consists of two Black Magic KL recurve hooks (very similar to circle hooks) that are tied on two dropper loops on Black Magic leader with a barrel swivel at the top for connecting to your mainline. The hooks are dressed with luminescent nylon feathers and are topped with a lumo bead. Snapper Snatchers are hand tied in New Zealand and the knots they use and the quality control is outstanding. I have used multiple Snapper Snatchers from Black Magic over the years and I have never had one fail or look like it was tied carelessly. They are always presented beautifully straight out of the pack and very easy to out from the pack and rig on your line as they’re presented on a very manageable piece of rigid foam. It’s important to note that one of the key elements that make them so successful are Black Magic’s hooks. While Black Magic is out of NZ, all their hooks are Japanese chemically sharpened, carbon steel of the highest quality. The hooks are sharp, have excellent penetration even on light drag settings and do no fail on heavy drag settings. The best way I have found to fish Snapper Snatchers is to add small strips of squid to the hooks and deploy them straight down from the side of the boat and lift them a metre off the bottom. Rigging them on a stiff rod allows the natural rocking action of the boat to gently work them up and down without the rod absorbing movement; the boat can create this movement with the rod in the rod holder or by the angler slowly lifting. The beauty of the KL hooks is that the snapper hook themselves right in the jaw which results in rarely if any fish lost or lost rigs and it’s far easier to remove the hook. The KL hooks also cause far less damage to the fish if you are releasing them. While that is the way I personally fish them it isn’t the only way. 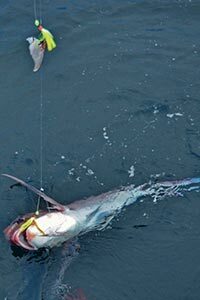 They can be cast our away from the boat and will work just as well as the droppers float and waft around the current. These rigs are a simple design and are the highest quality. They are very economical for the materials used and you don’t lose them easily. If you’re not already using them I highly recommend buying a few.